This card had really caught my eye, the cashback rewards were perfect for me and the $150 bonus is very nice. Being in college I have not had much of a chance to build my credit the way I'd like so my credit score was a measly 614 when I applied and they still accepted me and gave me a $5,000 credit line. If you don't have the greates credit score give this a shot and apply, the credit line alone is worth it as it helps immensely with utilization. Quick application, 4% cash back. Instant approval with a $30,000 limit, scores in the low 720’s . $500 cash back with 3000 spent in the first 3 months. Simple enough..
one thing I forgot to mention, Since I was one of the first kids on the block to get this card, I was grandfathered in to the 0 fee club and the upgraded features 2,3,4 club. I had four Capital One credit cards and used them frequently despite terrible service from Capital One because the rewards were worth the aggravation. 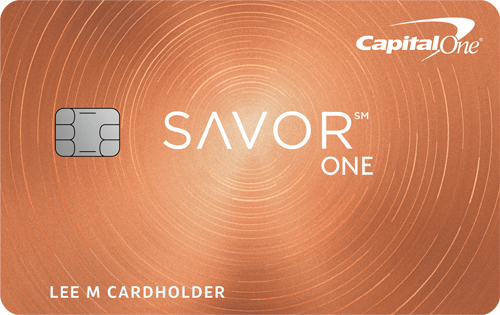 When my Savor card was canceled by Capital One because I used it too much I decided to cancel the other three cards as well. To reiterrate, Capital One closed my account because I made too many purchases that they deemed my purchases weren't consistent with Consumer Purchases. They didn't consult me or give any guidelines of what's expected of card usage, they just closed the account. No opportunity to speak to anyone who makes the decision or find out how the card was used innapropriately, only talk with a supervisor in customer service that said the decision was final. The application process was also terrible. My application was initially declined and after two months of phone calls, waiting, account reviews, and adjusting the credit limits on my other three cards my application was approved and I received the card with a $30,000 limit. My application wasn't initially declined because of my credit score, it was declined and Capital One made it excessively difficult to speak to anyone that makes decisions regarding the account. what is meant when you say not consistent with Consumer Purchase.....what were you purchasing ? called customer service about the $500 cash bonus after spending $3000 I was informed that there is no such offer. That bonus is for the regular Savor card. You probably have the Savor One. 22 year old college student with not a lot of income, credit score in the 730's on both reports, approved for a 5,000 credit line. No foreign transaction fee, 4%back on dining, and the $150 reward for $500 spent, so many good qualities of this card. I love it!